I have a website and I need someone good with photoshop to edit a picture for the website. 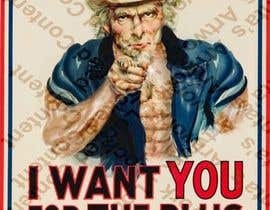 Starting from the image I give you named "I want you base" you have to modify uncle Sam so that he is a buffed man, and what I mean by that is that he has to be very muscular, in fact he has to be so muscular that the jacket and the shirt he is wearing are torn or ripped off. Secondly I want you to remove the stripe and stars on the hat. Finally, make sure to keep the color theme as it is, and what I mean by that is that the new picture has to look like a painting, exactly as the original file would suggest. Hope I made myself clear.